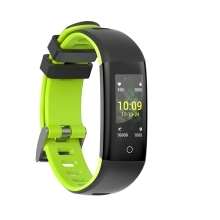 G16 smart bracelet will accurately record your daily steps, distance, calories, providing comprehensive health data for you, at the same time show in the mobile phone APP, build health data chart periodically. 0.96 inch full view HD color IPS screen. Top waterpoof reach IP67, you can wear it to rain, wash hands , but don&apos;t put it into hot water and not fit for swimming. Built-in polymer lithium 105MAH battery, normal use about 7 days, stand by about 21days. Heart rate and blood pressure monitoring. Record your daily steps, distance, calories, providing comprehensive health data for you. Sleep monitor: recognize your sleeping status, sleep degree, light sleep time, deep sleep time and awake hours.